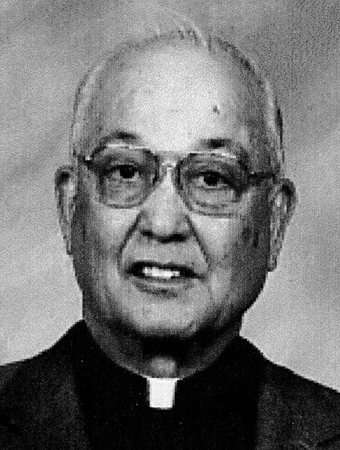 Father James Nishimuta died on October 7, 2011 at St. Teresa’s Residence. He was 84 years old and a Maryknoll priest for 57 years. James Kuza Nishimuta was born in Cushing, Oklahoma on January 24, 1927, son of Joseph Kutero Nishimuta and Louisa Lorenzo. He grew up on his parents’ farm with four brothers and three sisters, one of whom was Sister Jeanette Nishimuta, MM. He graduated from St. Anthony’s Grammar and High School in Okmulgee, Oklahoma, in June 1944. It was through his oldest sister, Sister Mary Jeanette, that he became interested in Maryknoll. He entered Maryknoll Apostolic College (Venard) on September 2, 1944. He received his Bachelor of Arts degree in Philosophy in June 1949 at Maryknoll Seminary in Ossining, New York and was ordained in Annunciation Chapel at the Maryknoll Sisters Motherhouse in Ossining on June 12, 1954. After ordination, Father Nishimuta was assigned to the Maryknoll Mission in Japan where he served for 47 years. During his language and cultural studies at the Franciscan Language School in Tokyo, he was assigned as Assistant Pastor at St Joseph Parish in Nishijin, Kyoto, with a native Japanese priest as Pastor. In 1956 he was appointed Assistant Pastor of the Catholic parish in Ise, Mie Prefecture, site of the famous national Shinto Shrine. In 1961 he was moved to Kusatsu Parish where he did pastoral work, while living in residence as Chaplain in the Kusatsu Hospital. In 1962 Father Nishimuta was appointed Pastor of the new Oyubari Parish in Hokkaido. There he immediately built a parish kindergarten that attracted over 100 children. In 1965 he opened a second kindergarten by contracting with the Mitsubishi Company to take over the company kindergarten. On July 1, 1967, Father Nishimuta began a new phase of ministry as Director of Hope House for indigent poor and outcasts in Kyoto. This involved a great deal of social welfare work. On March 15, 1971 he was appointed Pastor of the Makomanai Parish in Sapporo, Hokkaido. On December 28, 1977 he was appointed Pastor of a new parish in Hanakawa, Ishikari, Hokkaido. Again he built a kindergarten for 132 children and a multi-purpose chapel and rectory. After three years he was reassigned as Pastor and continued to expand both the kindergarten program and his adult convert program. On December 19, 1983 he was reappointed Pastor for a third term, and remained Pastor of the Hanakawa parish until June of 1993. A fall from a ladder while painting his kindergarten in Sapporo and a slight heart attack caused Father Nishimuta to consider retiring and returning to the U.S. However in 1996 the Directress of the kindergarten became ill, so he chose to stay on in Hokkaido to help out. He covered several Maryknoll missions in Tomakomai, Shizunai and Muroran when his fellow Society members were on furlough or holiday. He retired on April 1, 1997, remaining in Japan to help out as needed. In November 2001, Father Nishimuta was assigned to the Retirement Community and came back to the United States to reside in McAlester, Oklahoma with his family. He moved to Mission St. Teresa’s in January 2008. Wake services were held at 4:30 p.m. on October 13, 2011 at St. Teresa’s and at 7:30 p.m. in Queen of Apostles Chapel at Maryknoll Center where Father Joseph La Mar officiated and Brother Thomas Hickey read the biography. Mass of Christian Burial was concelebrated in Queen of Apostles Chapel on October 14, 2011 at 11:00 a.m. Father Emile Dumas was Principal Celebrant and homilist. Burial of his cremains will follow at a future date in Maryknoll Society Cemetery.